Caballerizas Bikuña organizes camps for children in summer months and in other puntual situations. The aim of our camps is that the children meet the horse world and especially that the children enjoy themselves and have a lovely time. IT IS NOT NECESSARY TO KNOW HOW TO RIDE HORSE BECAUSE WE CAN DO DIFFERENT GROUPS WITH THE CILDREN DEPENDING THE RIDING LEVEL. Caballerizas Bikuña is in the county of Alava, very near Vitoria but also Pamplona, San Sebastian and Bilbao. One week (from Sunday to Friday). 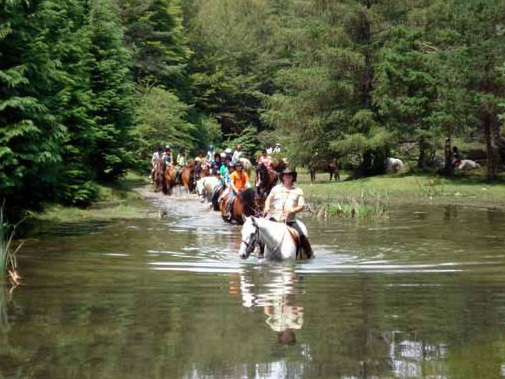 The main AIM of these camps is that CHILDREN HAVE A REALLY LOVELY TIME; they will ride horse a lot and also learn the principal fundaments of equitation as well as they will learn the basic to take care of horses. Everything will be carried out with good humour and games prepared by our monitors. IT IS NOT NECESSARY TO KNOW HOW TO RIDE HORSE.